I know, I know...I'm technically on "vacation" right now. But guys, these bows. This girl. It's cause to take a day off of vacation to write a little post about. 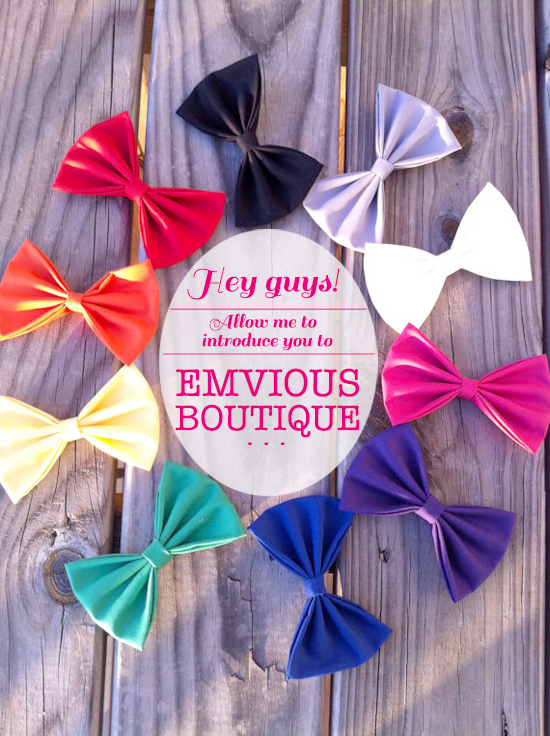 I have to introduce you to Emily, of Emvious Boutique! She's crafty (we know how much I like crafters! 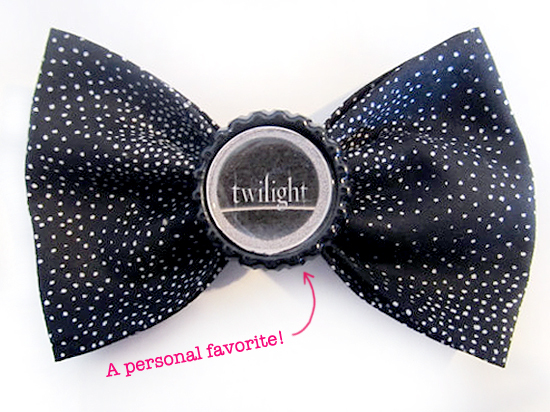 ), sweet as pie, and seriously makes the cutest hair bows your eyes ever did see! Each bow is handmade by this mama of two (major props to that!) using fabric she has hand picked herself. Which means- every bow is basically amazing! Tell us a little about yourself (outside of your bow making business)! My name is Emily and I have recently transplanted from my native southern NJ to southeastern TN. I am a mommy and wife first, and a business lady second. I met my soul mate, George, when we were in middle school and we have two daughters, Julie, 9 and Grace 2. I am one of seven kids, I fall somewhere in the middle of 4 sisters and 2 brothers. How did you come up with the name, "Emvious Boutique"? I came up with the name for my shop driving across the Walt Whitman bridge into New Jersey after visiting my sister in Philadelphia. It honestly hit me like a ton of bricks out of thin air. I had been mauling over shop names for days and I really wanted something that incorporated me as a person, but also my family. Obviously, my name “Em” is in my shop name, but the “envious” play on words was 100% for my family. My sisters, mom and I all have a running inside joke where when one of us gets something new, whether it be a candy bar or even a new hair cut- we tell one another “don’t be jealous!” So, jealousy/envy + Emily= Emvious! My boutique’s slogan is “Be Emvied”. Honestly, it’s hysterical because we’re all happy for one another, but it stems from having so many siblings and really it’s just playful teasing. When I told my family my shop name, they all laughed and thought it was very fitting- and so Emvious Boutique was born. When and how did you decide that you wanted to make this lovely business? I decided to open my shop after working in the financial industry for too long. As the economy continues to struggles, it puts a strain on every single customer that would walk through the front doors of the bank. It became very taxing and affected every aspect of my life, whether I was working or off for the day. I didn’t feel light hearted and eager to go to work, I felt like I was going to deliver bad news all day everyday. I knew I needed to make a change in my life to get back to what I wanted my overall quality of life to be like, not to mention what lessons I was trying to teach my daughters. Which in essence is that there is no job, no amount of money, that should mean more than your own happiness and health. I wore hair accessories daily, and people would always question me on them asking where I bought them. I told my husband my crazy idea of leaving my bank job and opening up shop on Etsy, and he fully supported me. Nothing has ever meant so much to me as his words did that night when he told me, “I know it will be great because everything you put your mind to is always successful.” I then decided to quit my great paying job, jeopardize everything my family was working towards and take a leap of faith with the love and support of so many, but specifically my husband, siblings, one of my oldest friends, Nicki & a very special, important person in my life, Rabia. I am very happy to say that after 8 short months of being opened, my shop is flourishing and I have a great circle of loyal customers, many who I now call friends, some of which I speak to daily. I’ve gained so much from taking that “leap”- more than any corporate job could ever offer me. Is there anything special about the materials you use for your products? I use fabric, always. I mainly buy it from fabric stores, however I do try and support independent sellers on Etsy, who always have amazing finds or vintage fabrics. I also buy all my other supplies from other small businesses and not big, corporate companies. I truly believe in small businesses and what small businesses do for our country, but more importantly our families. I find inspiration most of my inspiration from my daughters, my husband, friends and the world around me. I walk up and down fabric aisles and buy whatever grabs my eye, even if it looks a little outlandish because I know if it caught my eye, it will catch others eyes as well. Take us through a typical day in the life of "Emvious Boutique". I wish I could say that I had a “typical day” at my shop, however I don’t! My husband works full time, so I work whenever he’s home, mornings sometimes but mostly late nights until the wee hours of the morning. I listen to a lot of classic rock to get me through those nights! Haha. What are some challenges you face, in working with fabric? The problem with working with fabric is that sometimes when I find something I am absolutely obsessed with, other people who work with fabrics, well, they feel the same way about it! Therefore, I will buy a yard or two, and go back to get more and its completely sold out AND on back order. It’s frustrating! There have been times where I have driven out of town, into 3 towns over, to try and find a fabric I need- with no luck! I never want to buy too much fabric though when I list a new item because honestly I am never sure what will catch and what will not, and don’t like to waste fabric, so I try and buy as I need it, with just some extra in stock. 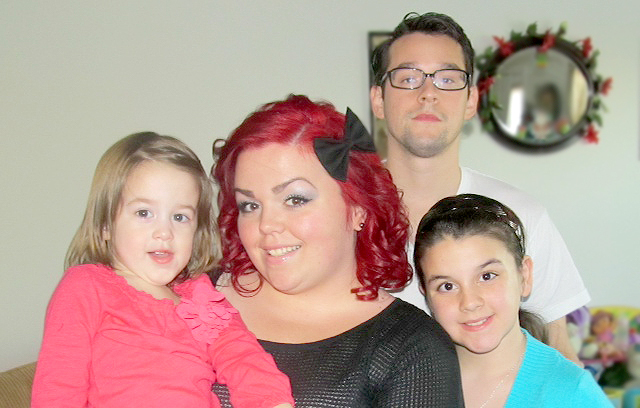 I enjoy my daughters and husband more than I can ever put into words. I don’t care if we’re home snuggling, watching tv, playing video games.. I enjoy them to the fullest. I also enjoy quiet things like reading, and listening to music completely undisturbed. It’s really like a cleansing session for me to clear my mind. Do you work from a studio/where do you make your products? I work out of our home! I have one side of my room as my “boutique”. It consists of a table, and lots of storage. It’s great working from home, but it does raise many challenges. My products are available online, on my Etsy shop. My favorite things to make are jumbo bows. 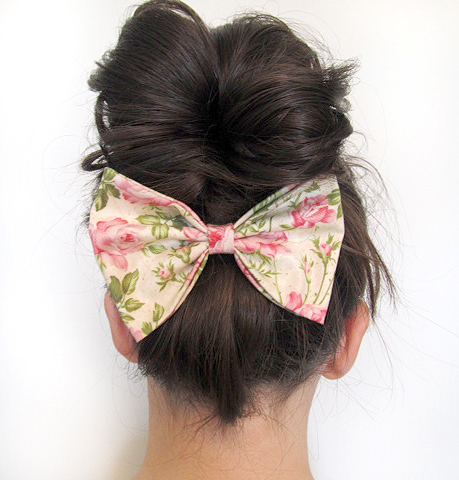 I don’t care if they’re solid bows, floral bows, silly printed bows- I love large bows. If I had name a few others, it would be anything leopard, and custom orders. I love when a customer contacts me with an idea in mind, and I am then asked to bring it to life. I love being creative and making these one of kind pieces for my lovely customers, and friends. How do you balance your bow work with your everyday life? As I said before, I try and work when my husband is home this way I can focus and also know that my daughters get to spend ample, quality time with me. It honestly got a little hectic this holiday season- but I know now for next year what I need to do differently to ensure my sanity! Haha. Special talents… I am a baker! I love to bake cookies, cakes, pies especially. My mother has always baked my entire life, and as she says, I was taught well! Any future plans you can share with us, for "Emvious Boutique"? I would definitely love to branch out from hair bows and bow ties to other fun things like aprons and such. I’m also working on a line of doggy bow ties, which I think are really fun and expressive. In the new year, I will be introducing a lot more solid colored bows, as well as bows with lace accents and tons of new florals! Thank you SO much Emily, for your honesty and your amazing bow making talents! Guess what readers?? Emily has been so amazingly gracious and is offering all Sweet Lavender Bake Shoppe readers 20% off their next Etsy order! Just enter code: Emvied at checkout! Coupon expires January 31st!